I was raised as an activist. My parents even took me squatting at the age of three. But one day I realised I’d stopped enjoying activism. I’m quite a shy person and I found that so much of political protest involved screaming at people while holding placards, or shouting at politicians to tell them how awful they were. It felt a bit like bullying, really, and it definitely didn’t agree with my sensibilities. But I hadn’t lost my desire to do something about injustice, and I kept asking myself: if we want to make the world kinder, more beautiful and more just, shouldn’t our activism be kind, beautiful and just too? Amid all the name-calling, shouldn’t we be able to do something nice? At the time, I’d started getting into cross-stitch and I wondered: could craft help to make the world a better place? So I began stitching political messages and putting them up in public as mini banners in the hope that people might share them online. I just wanted to try to start a conversation in a gentle way. Then I started a blog about it and it just took off. Suddenly I had people from all across the world asking to join in. Galleries started asking me to do events. International development charities such as Unicef asked me to create campaigns for them. One campaign we did even convinced Marks & Spencer to pay the living wage. We bought shares in the company so we could attend their AGM and made each board member a bespoke hanky, into which we stitched a message asking them to pay their staff the living wage. They really were bespoke: we googled the crap out of those people, used their favourite colours, decorated them with things that they liked… the hankies were even from M&S. They were totally overwhelmed and ended up working with us. One of them recently told me that her hanky has gone into the M&S archives in Leeds. It sounds like this deliberately quirky thing, but it really does work. It helps give quieter people who want to make a difference a way to make things happen. I’m so proud to have been able to do all the things I’ve done so far. I’ve delivered more than 300 talks and workshops, reaching 12,000 people. 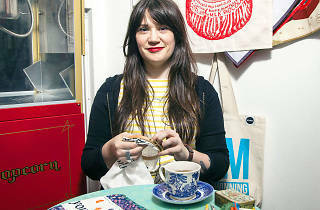 Unfortunately, craftivism isn’t something you can make money from. A lot of the charities or galleries who want me to work for them can’t afford to pay for it. I can’t do it as a hobby as it’s just too much work, and I’ve realised that I can’t carry on week after week stressing about money. I’m just doing tiny jobs, getting completely stressed out by my financial situation. It’s a horrible place to be. I hate how much power money has over us. But I don’t want to give it up. I feel like so many people have told me how much of a difference my work has made to their lives. So this Christmas I’m asking people to ‘adopt’ me. 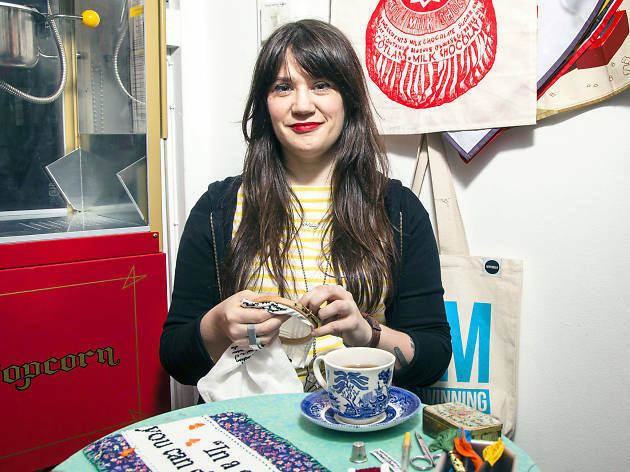 I’m looking for at least 160 people to give me £10 a month in 2017, so that I can earn the equivalent of the Living Wage and keep my Craftivist Collective alive. There are so many more things I want to do. I want to set up a school of gentle protest, to help shy people like me to learn how they can make a difference. I want to start teaching craftivism to kids. I want to expand the model of shareholder activism we used with Marks & Spencer. Ultimately, I want to carry on doing kind, gentle activism, because I don’t want to live in a world where we battle each other constantly. No one wants to live like that. Or at least I hope not.